It costs a little more than your standard IKEA affair, but this adjustable sit-and-stand desk is packed with intelligence and a desire to make you healthier. They say sitting is the new smoking, but “they” also can’t seem to agree whether or not bacon is truly good for you, so ¯\_(ツ)_/¯. Still, getting my Apple Watch has made me more conscious of the fact that I tend to spend long stretches sitting down when I’m working. The problem is, the Apple Watch doesn’t track sitting and standing quite in the way I thought it would. Stir’s Kinetic Desk M1 is a well-built, comfortable workstation with an electric motor that can quickly, smoothly adjust between sitting and standing positions. 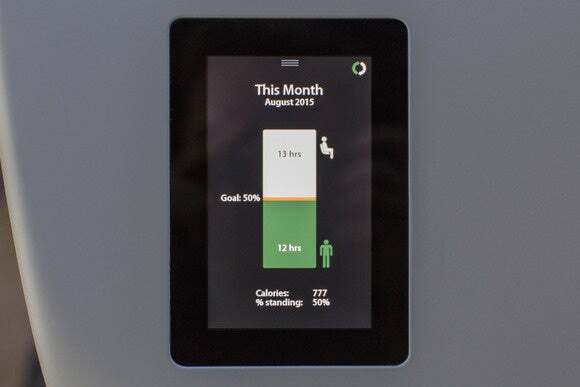 But it also has an embedded screen where you can set goals for how often you’d like to stand, and then the desk can actually remind you when it’s time to get up and even learn your preferences over time. People in the office noticed the M1 right away, and not only because I was sitting at a new workstation a short walk away from my old adjustable desk. The M1 is a great-looking piece of office furniture. It’s got a curved edge that I love, as someone who knows I’m not supposed to rest my forearms on the desk while I’m typing, but types like that all the time anyway. The sloped edge is so much more comfortable under my arms, whether I’m sitting or standing. The M1 comes in white or black. If you're ordering them for a whole office, you can get them customized to match the rest of your furniture. 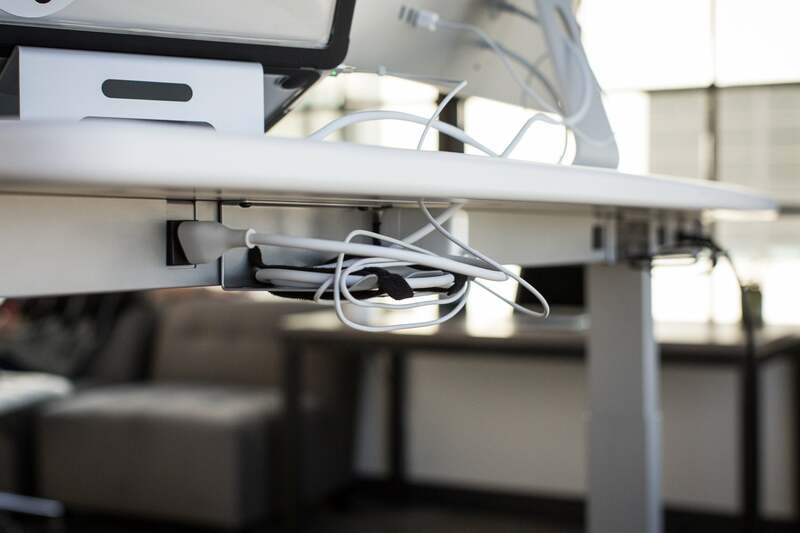 A cable slot lets you tuck your cables out of sight, and you can plug your laptop, display, and other peripherals into four three-pronged outlets on the back of the desk. Two small metal shelves give you a place to stash excess cable or adapter bricks, and tie the whole mess down with Velcro straps, but I had to fiddle for quite a while to make my cables look neat and tidy on the shelves. (Stir’s flagship desk, the F1, has built-in compartments for your power adapters and cables, complete with eight power outlets and four USB outlets, so all your cables can stay totally out of sight.) But once I got it all set, I loved how I only had one cord plugging in the desk, and didn’t have to worry about dangling cables getting snagged on anything when I put the desk up or down. The cable shelves aren't quite as tidy as the F1's built-in, out-of-sight-out-of-mind compartments, but at least nothing is dangling down. The adjustment from sitting to standing was very smooth—I could keep reading, if not typing, as my desk rose or fell to its next position, and the desk didn’t wobble in any position unless I was typing really, really hard. 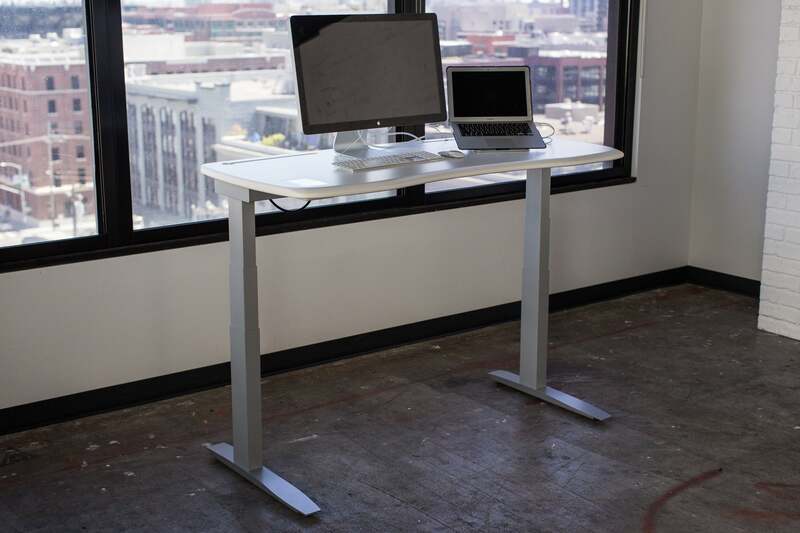 But the Stir Kinetic M1 is more than just a desk that goes up and down and looks good while doing it. 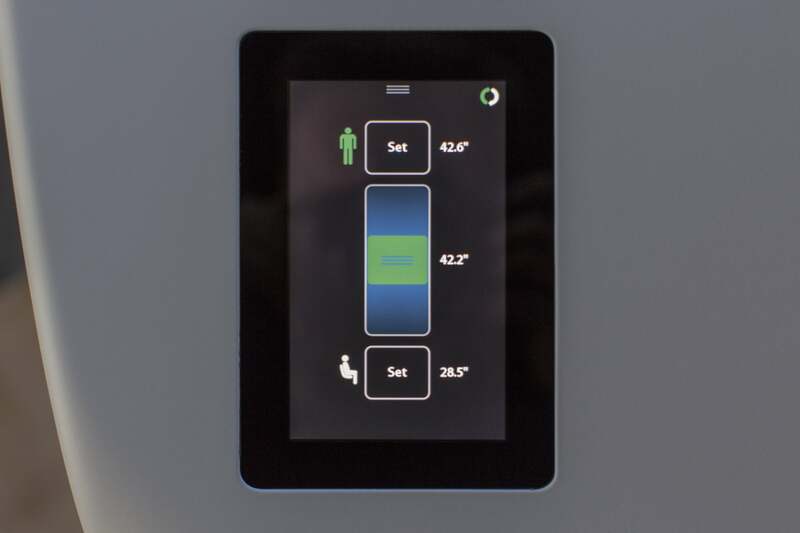 It’s got a 5-inch capacative touchscreen embedded in the surface, sensors that know if you’re at the desk or not, and artificial intelligence to learn your habits and nudge you toward healthier ones. The screen's main interface, showing my sitting (white) and standing time (green) on a circular grid. Just double-tap anywhere to switch positions. I started by adding the desk to my Wi-Fi network and creating an account. That’s all done on the touchscreen—the M1 doesn’t have a companion app for your smartphone or computer, although it can send your data to Fitbit (more on that later). In my account, I entered my height, weight, and gender, and set my goals, starting with standing for 40 minutes at a stretch, for a total of 35 percent of my day. It’s easy to adjust these goals as you go along, and by the end of my two-week test, I was standing for 50 percent of my day—and really enjoying it. The screen shows your progress over each day, week, month, and even the whole year, with your goal clearly marked so you can see at a glance how you’re measuring up. It’s easy to swipe between views and tap the graphs for more info. You can see graphs by week and month, as well as an estimate of the extra calories you've burned by not sitting all the time. When it’s time to switch positions, the desk uses an optional feature called WhisperBreath to prompt you. You could leave this off and just remember to switch positions on your own, and the desk would still track your sitting/standing time and calories burned, but I found WhisperBreath to be a great solution. The desk just kind of “breathes,” subtly raising itself ever so slightly, and then lowering back down. It’s timed to a human breath, and it feels like the desk is giving a little sigh. You can reach over and double-tap the screen to change positions, or just ignore WhisperBreath and keep working. It’s a nice, nonjarring reminder, and I found it easy to ignore if I was comfortable where I was. But most of the time—pretty much all of the time—I was willing to move when the desk wanted me to. Over time, the desk is supposed to learn your habits based on if you respond to the WhisperBreath prompts. If you never stand up in the morning, it should stop asking you to. I had a loaner M1 for a couple of weeks, and since I generally responded affirmatively to the prompts, I can’t really evaluate how well it learned from me. The desk remembers each user's preferred heights, and you can make little adjustments here anytime. The screen doesn’t seem as high-resolution as it could be—it’s 800x400, which is good enough to read the graphs, but for eyes accustomed to Retina displays, it can look a little soft. I did have to reboot the desk twice during my testing period, once when it wasn’t graphing my sit/stand time, and another time when the date was stuck a few days in the past. Both times, simply unplugging the desk, waiting 10 seconds, and plugging it back in was enough to get things working again. And telling Twitter you have to reboot your desk is a fun way to pass the time while it starts up. The M1 supports multiple users—as many as you like, no limit—in case you put it in an office and want to share with coworkers. You can log in and out via the screen, but the desk also has Bluetooth, so if you have a supported Fitbit device, the desk can recognize you based on that. It even sends an estimate of your calories burned to your Fitbit, so you get credit. I loved seeing a total of my standing time per week in the Fitbit app, and the calories burned go on the Dashboard too. That’s great, but for this price, I think the Fitbit integration should be a little more robust. 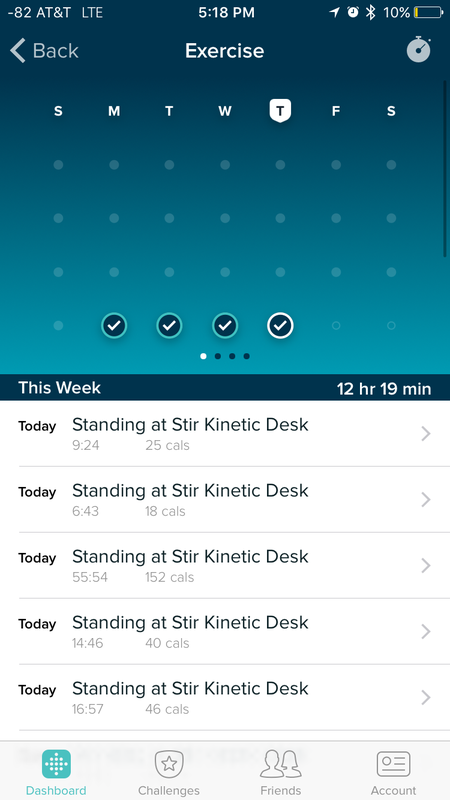 When I first saw the Stir Kinetic F1 when it launched in 2013, founder JP Labrosse mentioned that someday the desk could take your Fitbit data into account when prompting you to sit or stand: It could learn, for example, that on days you take a run in the morning, you’ll want to sit until the afternoon, but on rest days you could stand a lot earlier. When I saw the M1 at CES back in January, Labrosse said that feature was being beta-tested. 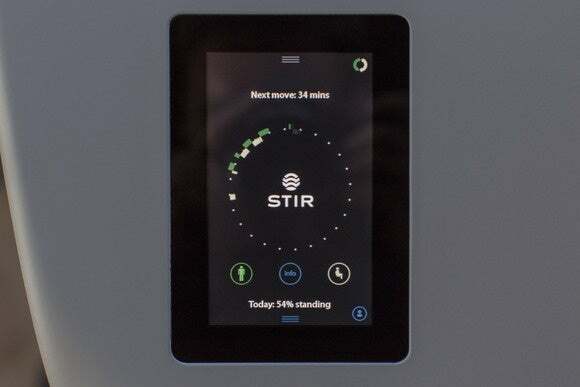 It’s still not live, but since the desk is connected to Wi-Fi all the time, Stir can push updates whenever they’re ready. I’d also like to see more Bluetooth devices being used to identify users—chances you have a Bluetooth smartphone are much greater than the chance you have a Fitbit. I loved seeing my calories burned showing up in the Fitbit app, but Fitbit doesn’t natively support Apple’s HealthKit, so that data isn’t sent to the Health app. A $3 app called Sync Solver can send Fitbit data to Health, but I’m running the iOS 9 beta, and Sync Solver crashes on launch. It’s worth noting that you can also export the data from Fitbit’s website—this used to require a premium subscription, but now it’s free for everybody. The embedded 5-inch touchscreen is removable and replaceable, so if Stir ever updates its components, you won't have to buy a whole new desk. So I can see the benefit to passive tracking—thanks to the proximity sensor, the M1 can tell if you’re at the desk and just keep the clock running. The metric you’re most interested in is the percentage of time spent standing. It was easy for me to start with a goal of 35 percent and work my way up to 50 percent in just a couple weeks, by just nudging my goal up a little at a time, and following the prompts to stand. (It’s also easy to cheat the percentage by just doing your sitting-down work in a different location, but that’s on you.) About a week in, I seemed to hit my sweet spot: I found myself reaching over to double-tap the screen and raise the desk a few minutes before it asked me to. The M1 also showed me how I can stand for a longer period of time total if I don’t try to do it all in one chunk. With my old adjustable desk, I would put it up at two times: seldom or never. Most days it would stay down, and on days I would put it up, I would put it up once, stand until I couldn’t take it anymore, and then put it back down. 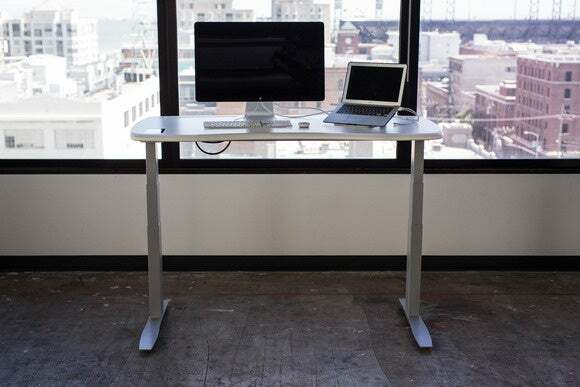 The M1 got me to change positions more frequently, and even when the review unit was sent back, that habit carried over to my old adjustable desk—I’m standing at least twice a day and usually more. This desk is expensive—it certainly isn’t in my personal desk-buying budget. 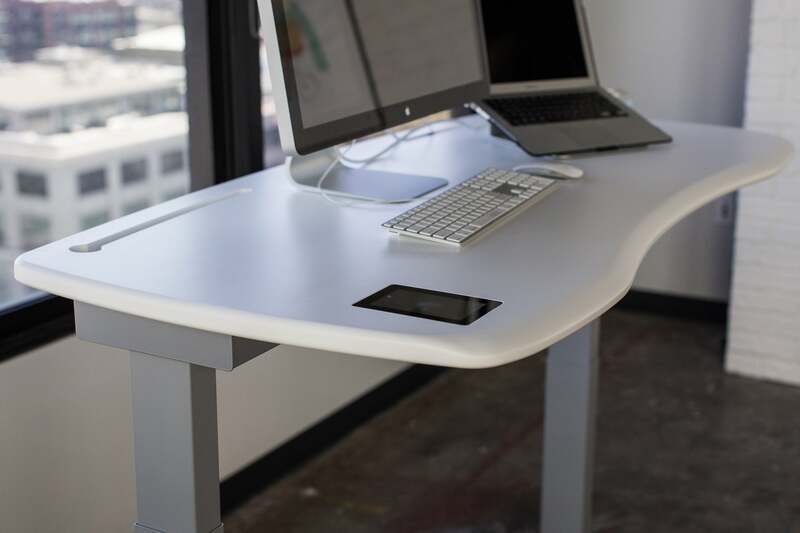 But if you can afford it, the Stir Kinetic Desk M1 is hard not to like. It looks good, it’s fun to use, and it can nudge you to be healthier. If I could do what this desk does with a cheap wearable or smartphone app, I’d be interested, but the M1 has the whole package. I found the M1 insightful, delightful, and way out of my price range. Good looks and cable management. WhisperBreath is a great eyes-free reminder of when it's time to move. Screen resolution isn't amazing, although it's good enough.